One of the most challenging aspects in a registered representative’s career is moving from one broker-dealer firm to another. Moving from an established brokerage firm or investment advisory firm to your own startup brokerage or advisory business can be equally challenging. 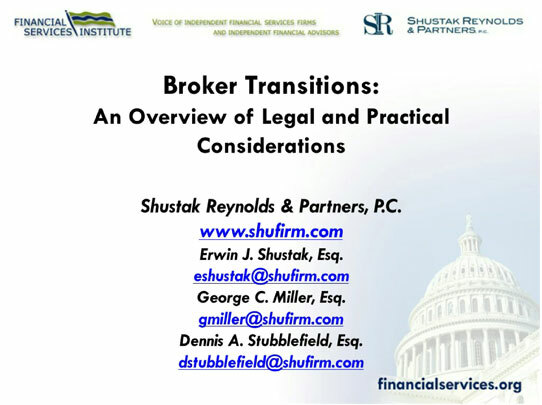 Shustak Reynolds & Partners, P.C., is here to help you make such transitions as smooth as possible. We offer a free initial consultation to start the transition process. At Shustak Reynolds & Partners, P.C., we also have significant experience with forgivable loan notes, or “golden handcuffs.” In such matters, we are known for striking pre-emptively on our clients’ behalves. Although results vary from case to case, we have often been able to get our clients substantial discounts on their promissory notes.